A few interesting things happened since Emily picked up shop, moved over by George and laid her eggs. One is that her web spinning has changed. She moved from the top of the screen where she'd been making webs about six inches across that looked like a tangle of hair you'd find in the drain. But now she's moved over by a wall and begun spinning proper orbs. Her most recent web is three feet across and looks like birds have been flying through it all day. There are several large holes where, I'm guessing, large insects have collided with it and either escaped or been eaten. I'd thought she was rebuilding her web every day, but I'm not sure. Her current one has sustained a lot of damage and I think it may be several days old. I've started mapping the holes so I can better tell what's been rebuilt and what's brand new. Her web is very difficult to see during the day. It's easier at night with a flashlight to see the individual strands of silk that make it up. One really interesting thing is that she's started creating "stabilimenta" or web decorations. The word comes from the original belief that the designs were meant to make the web stronger. Scientists don't think that's what they're for anymore, but nobody is really sure why some spiders draw designs on their webs, though there are some theories. E.B. White apparently spent a lot of time reading about this and bugging araneologists about it while researching Charlotte's Web and by the number of spider experts who quote him in the introductions to their books, he got a lot of things right. So that those of you afraid to click on the lj-cut for fear of seeing a spider, (no matter how cute) I've made an edited version that I'll put here in front of the cut so you can see how cool what she's doing is. Some of Emily's web art. Spider replaced with non-threatening artwork for the spiderphobic. Uncensored photos behind the cut. Any thoughts on why she's drawing things? Emily's artwork! Clickenzee to Embiggen! Emily celebrating her art opening with a tasty fly. Clickenzee to Embiggen! Emily's art. Clickenzee to Embiggen! Some spiders have up to six different types of silk to choose from and choose the silk used for their artwork very carefully. I believe Emily, being a hackled-web spider has only one variety of silk, cribellate, which is not sticky. There is a constant battle between moths (and other insects) and bats; each instance of species on species predation results in an arms race of location, detection, evasion, pursuit, etc, with constant improvement and refinement on both sides. 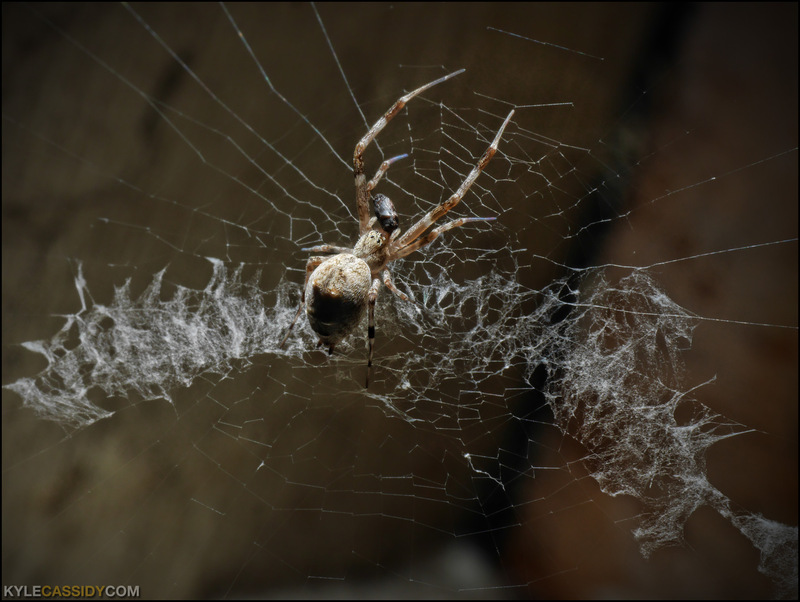 Spiders with their webs and their prey have a similar dance, with the spiders (well, nature/evolution) experimenting with different web designs etc to fool the bugs into the web. In the case of orb weavers (and relatives), the decoration could be another layer in the interplay between the hunter and prey. 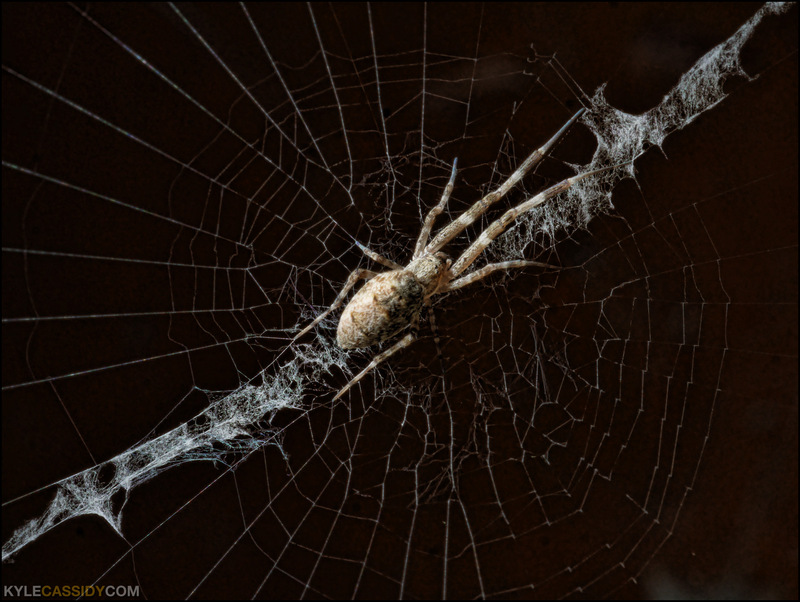 If a population of flies evolve a pattern recognition that allows them to evade a classic spider's web, perhaps the different orb weaver patterns are just enough to confuse that ability. Making for a better fed mama and a lot of well fed spiderlings. Given that I find flies (and mosquitos) a lot more annoying than I find spiders disturbing, I favor the spiders myself. Oooh, that's a good possibility. Like sticking its head on sand changing an ostrich's shape. Some of the research that has been done has been with stingless bees that spiders like to eat. They can recognize stabilimentia that they saw the day before and will avoid the web if they hit it the day before, but if the stabilimentia changes, they'll fly right into it again. I'm very disappointed that the mona lisa is photoshop, not Emily's work. Soon I will have an infinite number of spiders and will begin looking for an original to swap this out for. oh wow! this is so fascinating! I would imagine that spiders make art for the same reasons people do. Maybe it's boredom, maybe self-expression... who can tell!